His paintings, of farmhands, sunflowers, and starry nights, can easily be described as scenes from a dream, where ordinary subjects often take on a quality that’s colorfully supernatural and otherworldly. In the letters Van Gogh would write to his brother Theo, he would often talk about his insomnia resulting in sleepless nights and dreary, lethargic mornings; and how it was taking a toll on his art. Insomnia is unfortunately all too common, and if it’s left unaddressed, it could lead to more complicated physical and mental illnesses. Van Gogh of course is a famous and tragic example of someone falling victim to their mental illness. Though Van Gogh lived in the late 1800s, the problem of insomnia clearly still has not been resolved. In fact, according to the American Geriatrics Society (AGS), Insomnia is extremely common among adults, and even more so in older people, with around 30% of all adults over age of 65 suffering from insomnia. Stick to a regular schedule of what time you go to bed and when you get up, even on week-ends. 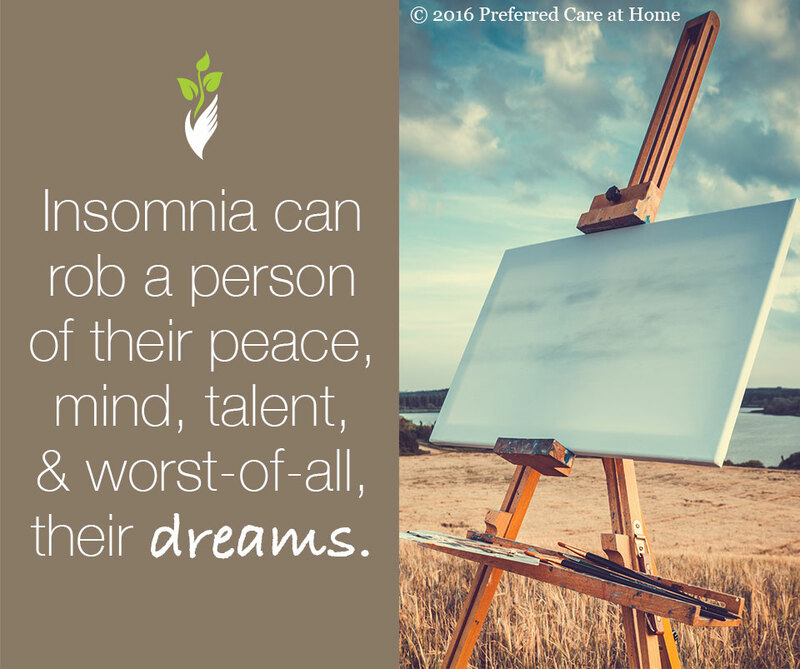 Insomnia can rob a person of their peace, mind, talent, and worst-of-all, their dreams. So, if you or your loved one suffer from insomnia, please try not to ignore it and do what you can to address it as soon as you can.